There are a number of simple games I like to play when waiting for a package to download or compile. Often the available themes don't really suit me, and in any case I like to make themes or skins when I can. 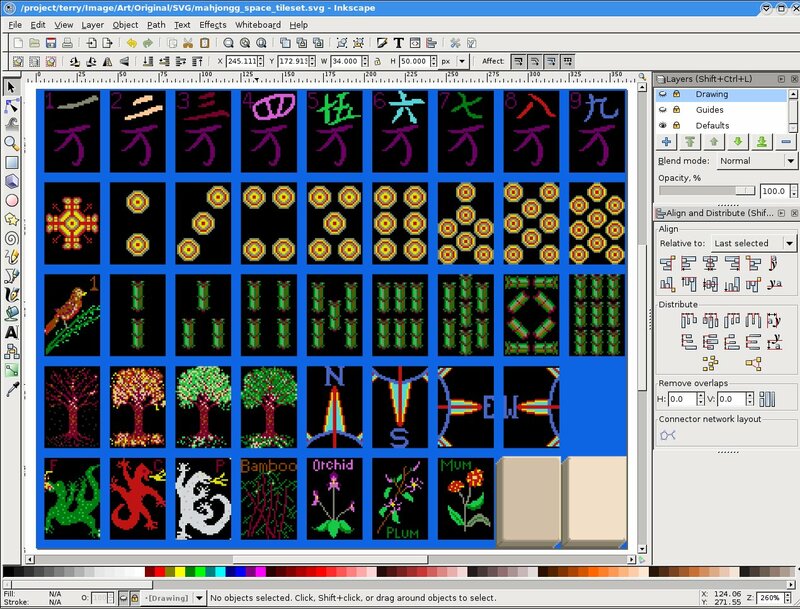 One of the easier packages to create an alternate theme for is KDE Mahjongg (kmahjongg), which I will demonstrate here using Inkscape and Gimp. 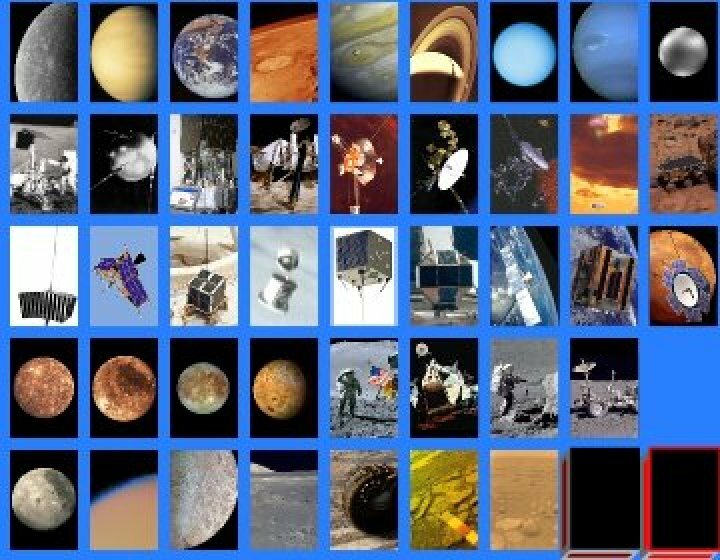 With the 40th anniversary of the Apollo 11 moon landing coming up, a space exploration theme seems appropriate. KMahjongg is a simple tile-matching game using Mahjongg tiles (actually, "Mahjongg" is a four-player game, but this is a kind of solitaire game, sometimes called "Taipei", which uses the same tiles). 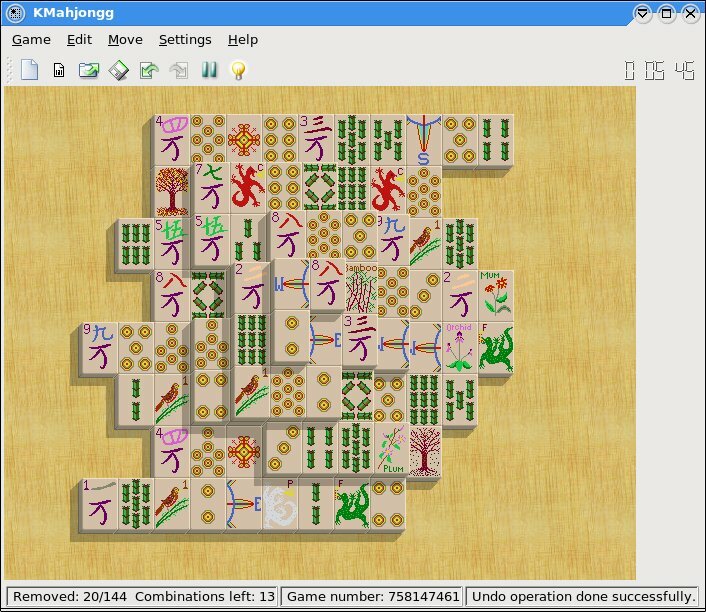 A "theme" for KMahjongg has just two parts: a tileset and a background. The background can be any image you choose, either tiled or scaled, and is trivial to change. 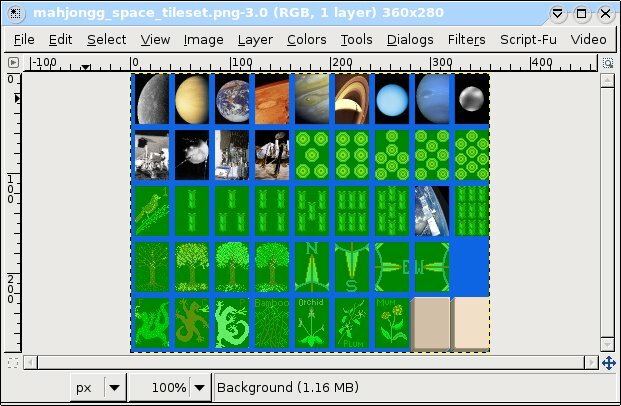 The tileset is a single image file in Windows BMP format, although the extension ".tileset" is used for it. The KMahjongg package comes with a default tile set based on the traditional Chinese style and a "pirates" set that can give you an idea of what can be done. Clearly, you can make this more complex by drawing intricate tile designs -- but be aware that the tiles are only 34x50 pixels, so there is limited detail available. The color depth is full RGB, though, so it's not difficult at all to create a photographic set. The full tileset image is 360x280 pixels in size. 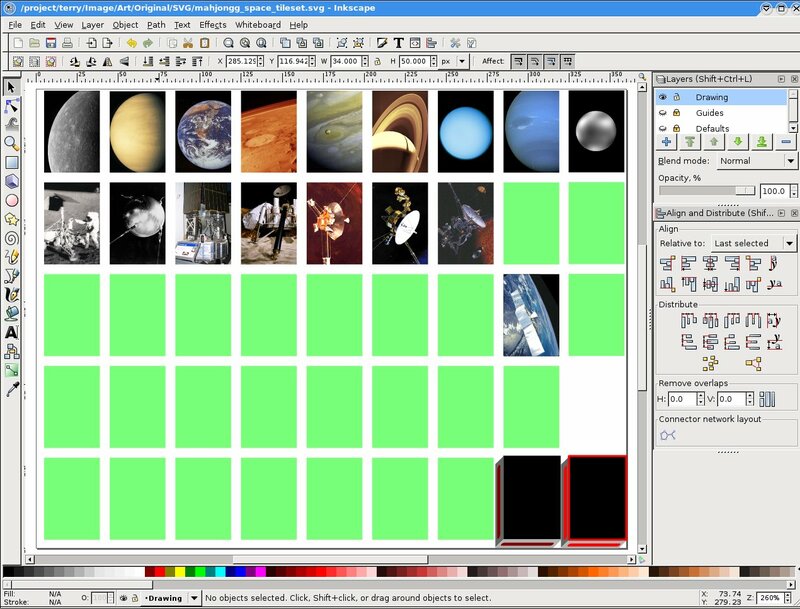 For this example I'll be using public domain space photos to make a very simple tileset without too much work. I've got quite a collection of these. First, I loaded the default tileset into Gimp, then saved it again as a PNG file. Then I opened the PNG file with Inkscape. Inkscape default behavior when opening a bitmap image is to create a new SVG document with dimensions in pixels and the image as an object in the "root" level of the document. This is almost exactly what we want, except that we want to create a layered document. This will move the image from the root to the default layer. When working with an unknown skin layout, it's useful to use the "guidelines" to explore how the file is laid out: just click and drag from the rulers on the top and left side of the canvas (drawing area) in Inkscape. A number in the lower right hand corner of the window will read out the location of the guideline, and you can figure out which pixel various elements are supposed to start on. In this case, the layout is pretty simple: it's a 5x9 grid of 40x55 elements, each representing a tile. 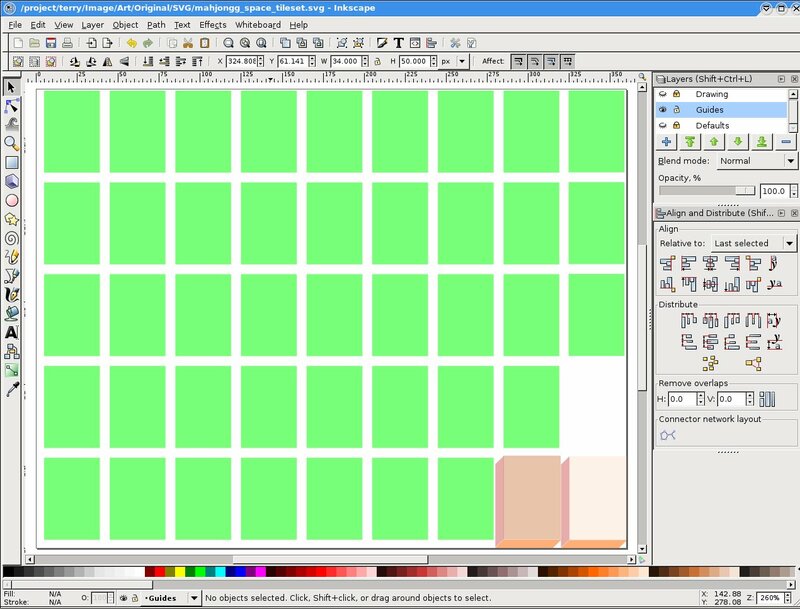 Within each element, only the 34x50 pixels in the upper right of each cell is used to draw the tile for all the tile tops. In the lower right hand corner, two extra tiles use the full cell space to draw the normal and highlighted appearances of the tiles (these show the sides of the tile as well as the top). In order to hold this information, we want to create a "Guide" layer, above the "Default" layer. Here we'll draw a model of the image layout we need. Lock the "Default" layer (click on the little padlock in the "Layers" dialog) so you don't accidentally disturb it. Using the rectangle tool in Inkscape, I simply drew a typical tile rectangle. I like to set the rectangle's color to a bright contrasting color, then reduce its opacity to about 50%. This way you can see behind the rectangle as needed, but it will still be clear where it is. To do this, you can use the widget on the lower left of the screen, or you can go straight to the Object->Fill and Stroke... menu. You will notice that Inkscape will let you enter the pixel-exact size and position in the tool bar, which is quite useful for this kind of precision drawing. Next, I duplicated this tile to create an entire row. Using the alignment dialog (Object->Align and Distribute), it's not hard to get a nice neat line by aligning the end two elements and then distributing the others evenly between. Then I grouped this into one object and repeated the process to get the rows aligned correctly. Afterwards, you can ungroup them all. Those elements are now our guides. Now that the guides are available, we'll start a new "Drawing" layer, locking both the "Default" and "Guides" layers -- except that first, we want to copy all of the tile rectangles from the "Guides" layer to the "Drawing" layer. 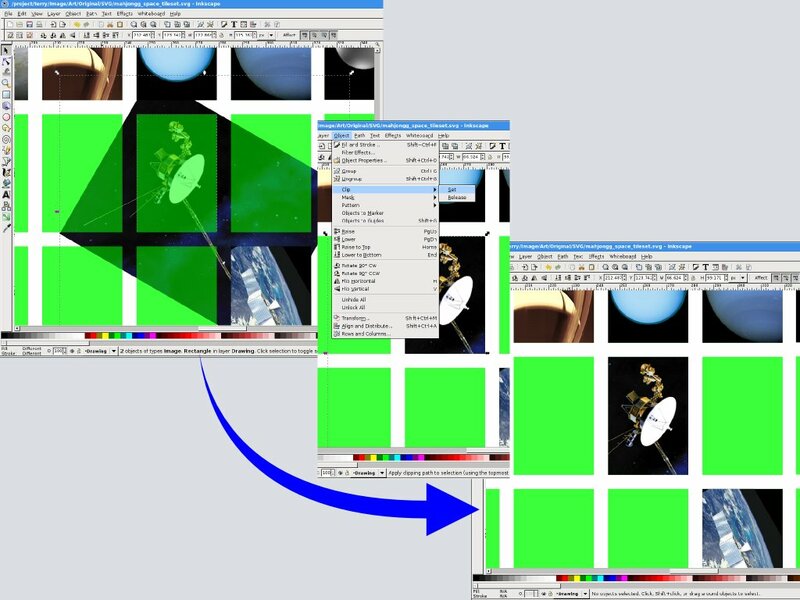 To do this easily, select all of the rectangles (it helps to group), then follow the same procedure we used to move the starting image to the "Default" layer (select, cut, change layers, paste-in-place). 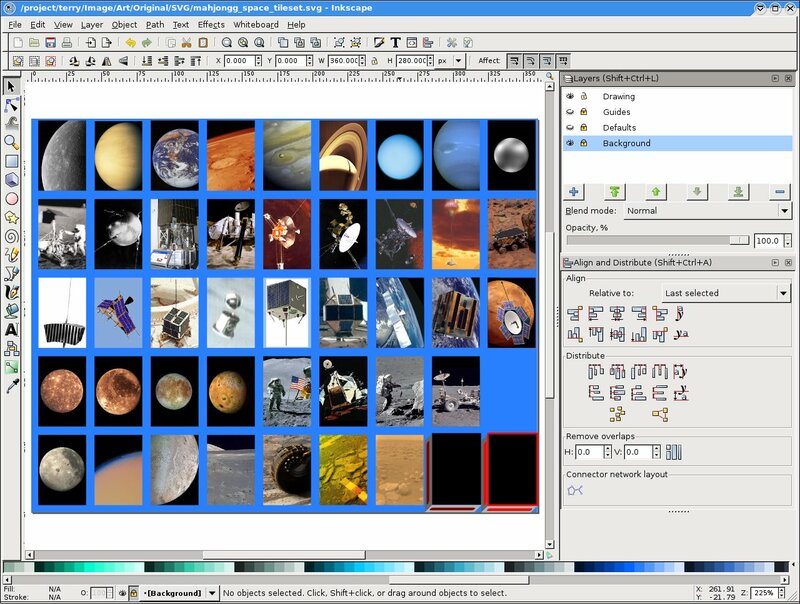 With the Default and Guides layers locked, and the tile rectangles in the drawing, we are ready to start selecting images and creating individual tiles. The two tiles on the lower left will require some kind of tile drawing. You can use any effect you want here, but the default "block" look is easy to obtain using rectangles. Start with the same rectangle as used for the tile tops, then duplicate. Use the arrow tool to move and stretch this to match the 5-pixel side and bottom edges of the tile. Click again with the same tool to get the rotate and skew handles. The skew handle will allow you to fairly easily match the slant of the sides of the tile. Note that you don't really need too much precision here, as this will all get rounded off when it is rasterized. Load this file in GIMP to see just how it will look. Of course, a lot of detail may be lost when the image is exported to such a small bitmap. However, you may be surprised at how recognizable many photos are, even when reduced so far. Now you will save the file in the correct form for KDE Mahjongg. In GIMP, select File->Save As. 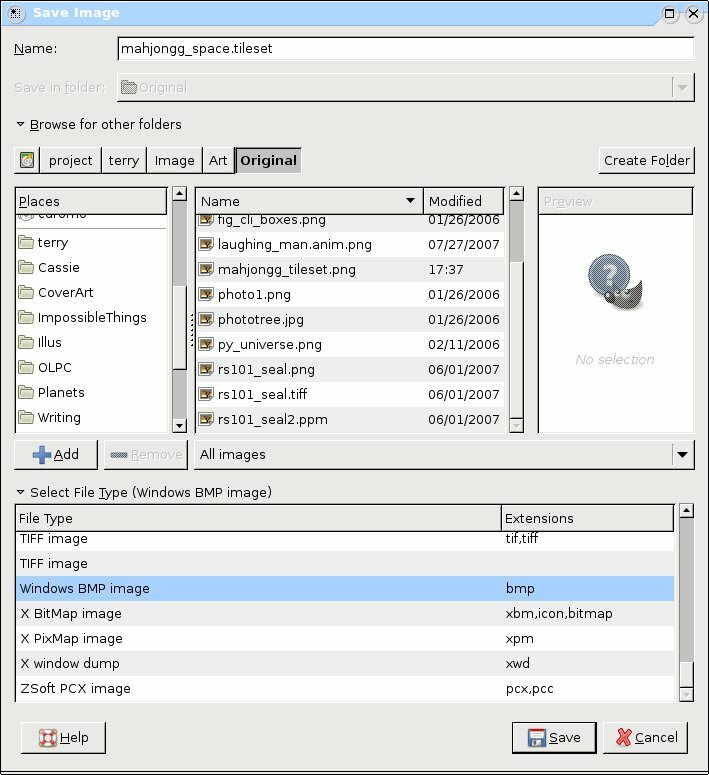 In the save dialog, use the drop-down menu to select "Windows BMP format" (do not use the automatic according to extension option), but set the actual file extension to ".tileset". Click "Save". 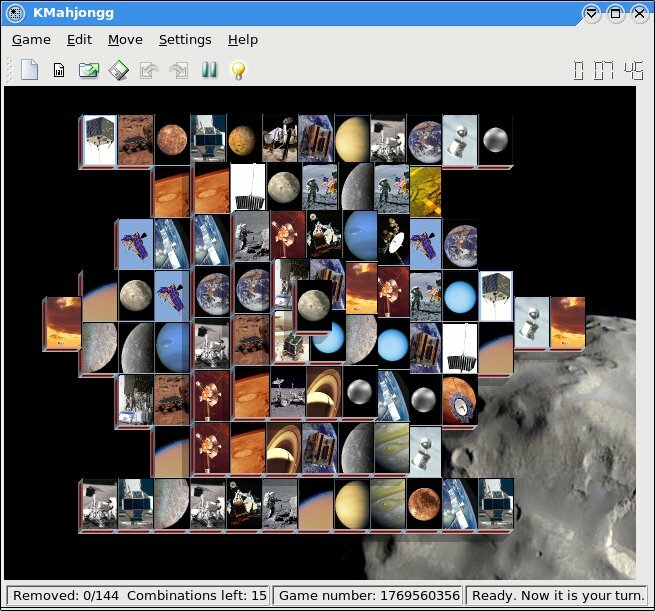 To see this set in action, start KDE Mahjongg, then use Game->Open Tileset... to get a file browser and find your new tileset. Set it and go back to the game, you should now see your new tiles. That's it! Now you can create your own tilesets for Mahjongg.